For thousands of years, the symbolism of Egyptian temples remained astonishingly consistent. The Egyptians seem to have never lost their vision of The True Temple. Despite all the political and social changes that occured over those thousands of years, the original concept of The Temple endured. The earliest Egyptian temple found to date is at Hierakonpolis in Upper Egypt and dates to about 3500 BCE. The city there was called Nekhen by the Egyptians and was sacred to a falcon God Who later became assimilated with Horus. This period is called the pre-Dynastic period because it was before the pharonic family dynasties fully established their rule; Egypt wasn’t unified at this point. Nekhen seems to have served as a kind of national shrine for Upper Egypt at the time. Very recently, a correspondingly important discovery has been made in Lower Egypt, the Delta area. Five temples dating to about 3100 BCE (also pre-Dynastic) have been discovered beneath the remains of a later temple in the eastern Nile Delta. The ground plan of these temples is unlike anything previously discovered in Egypt. (In what specific way, I can’t tell you right now as the work hasn’t yet been published.) In those Delta temples, they’ve discovered about 1,000 ritual objects, including pieces of a ceramic baboon, which may or may not provide a clue as to which Gods and Goddesses were worshipped there. But the Egyptians were creating sacred space even earlier than either of these sites. 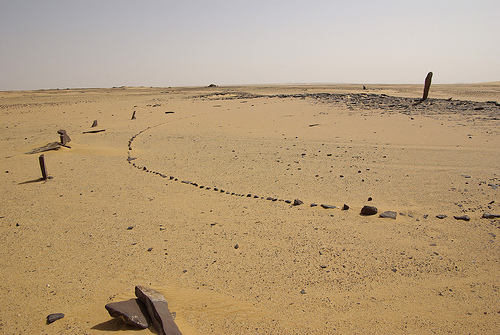 The oldest astronomically aligned stone circle ever discovered comes from Egypt—in the Nabta Playa in southern Egypt. The Nabta Playa circle, one of the earliest astronomical siting circles, created by pre-Dynastic Egyptians. It is 6,000 to 6,500 years old and stands on the shores of what was an ancient lake, now part of the Sahara desert. Some of the stones are 9 ft. high, many are smaller, and it seems likely that some of the stones would have been submerged partially during certain times of the year, perhaps serving as an early Nilometer—a device that measured the height of the Nile flood in later temples. The poles you see here may have been as much as 39 ft. high. The main building materials were reeds, mud, and wood. Some say that the shape of the shrine was the same as a domestic hut, just larger. Other say that it may have come from the shape of a mummified falcon, which later became a hieroglyph meaning “divine image” and “the God of Nekhen.” The slope of the roof toward the back of the shrine may even be related to later temples that became smaller and more narrow as you entered further in—as we shall see. So the shape of the temple itself, even this early, was a sacred form, a 3-D hieroglyph. In Lower Egypt (the Delta area), the form of the shrine is somewhat different. It has huge side poles and a domed rather than sloping roof. Eventually, the styles of Upper Egypt came to dominate, an indication that Lower Egypt was conquered by Upper Egypt, which lead to the unification of the Two Kingdoms, something long theorized by Egyptologists. A key feature of these early Upper Egyptian temples was a mound of sand in the center of the sacred enclosure. It is most likely that this mound represented the Mound of Creation, the First Earth which rose out of the Watery Chaos of the Nun in quite a few Egyptian creation myths. Thus each temple was, in symbolic and magical reality, the Primodial Place, the First Place. Each temple was the Egyptian Eden.